Ideas and locations to take kids fishing in SC. Fishing and the great outdoors offers kids an alternative to many influences they encounter in their busy lives today. A single fishing trip could be the turning point in a young life, and we encourage you to invest the time in South Carolina kids. The rewards are endless and it takes so little effort. Consider these small lakes, ponds, creeks and urban fishing locations as places to take a kid fishing in the Palmetto State. Kids, fishing and smiles naturally go together. Take a kid fishing and you just might change the course of their life. Then take pictures and send us one of them holding their prized catch. We will happily post it on our SC kids fishing photos page. Help us identify other youth fishing spots in SC. 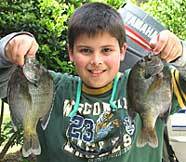 Ideas and locations to take kids fishing in South Carolina.